Over the Christmas Holidays in 2013, Mikey and Diva Dan are giving their entire home a make over with doing a completely new colour scheme. The colour scheme was created and decided by Diva Dan. We had transformed our living room first and then moved onto this area of our home. Diva Dan hasn’t planned the entire home. He is working with each room and then deciding the next colour scheme. 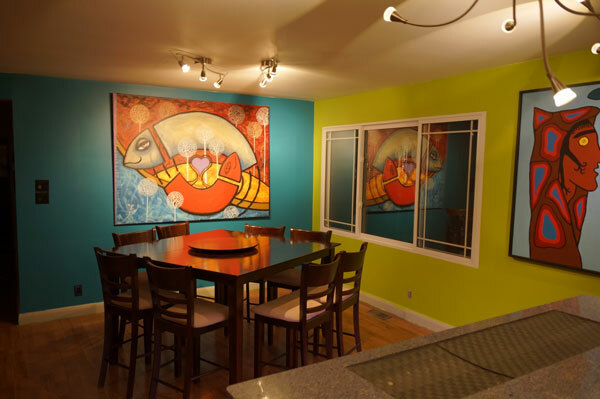 For the dining room, we have one wall that is exclusively the dining room and the exterior wall goes the span directly to the kitchen. The colour scheme had several conditions. Diva Dan knew the artwork he wanted to display. All artwork was already in place and have been up for years. He decided to look for colours to make the artwork pop. The cabinetry is a natural wood that is stained. Changing the cabinets were not an option. 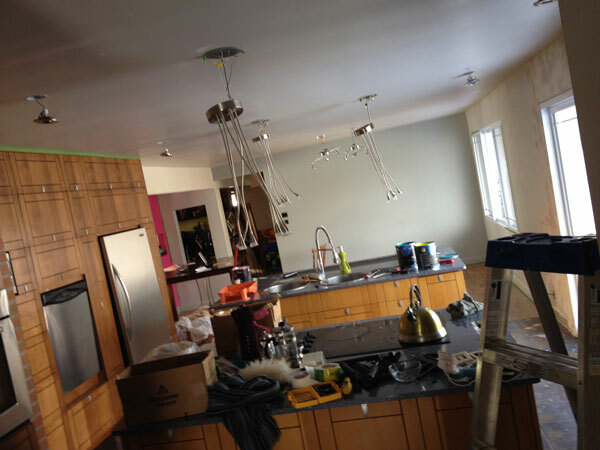 The surfaces of the two islands have a blue granite counter top. The hardwood floors were not going to be changed. Colour must go with the floor. The kitchen tiles are dark and the colour must work with them as well. The walls have to compliment the colours in the room. We used the Benjamin Moore Paint Line. Though Benjamin Moore Paints are typically more expensive than other brands, we opted to use the Aura Waterborne Interior Paint. Though the paint is more expensive, you do not need to prime in advance as this paint has the primer and paint together. We have a dealer for Benjamin Moore Paints here in Walkerton Ontario, they don’t have a website, nor do they sell online. The store is called Cuneo’s. Raised Dining Room Table was purchased on a clearance in a furniture store several years ago. It has since gone out of business since. The fish oil painting was painted by Kreso Cavlovic. Kreso is one of the most amazing artists we have ever known. 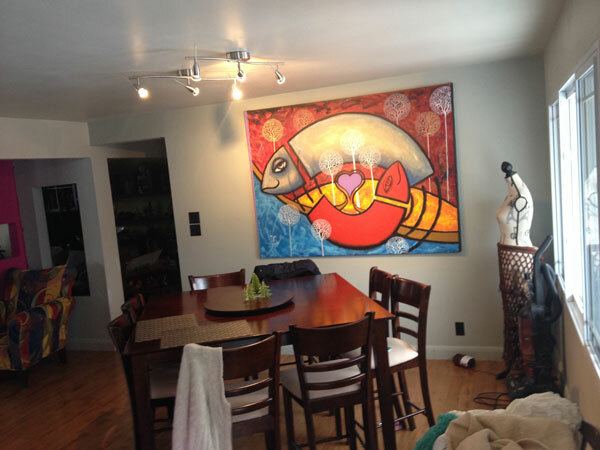 Originally painted in 1999, it remained in Kreso’s Collection until we acquired it in 2012. It has a lot of meaning for Daniel and I on a personal level. We love the boldness of colours. The native artwork is by Diva Dan himself. It is inspired by Norval Morrisseau. 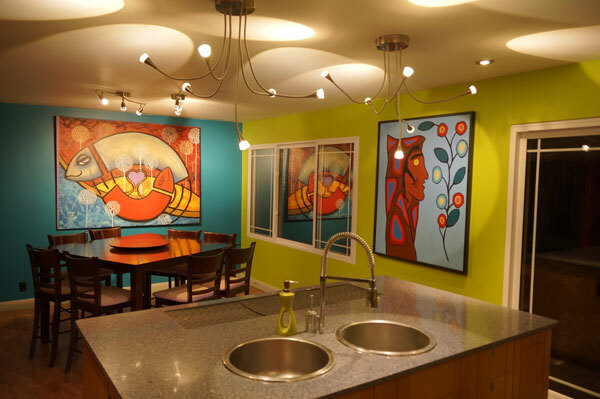 See original examples of Morrisseau’s Artwork. Morrisseau was an Aboriginal Canadian Artist that died in 2007. His artwork is very highly collectible and worth a lot of money today. These were Diva Dan’s interpretations of Morrisseau. Daniel’s versions are not meant to be a knock off of a brilliant artist. Our house was a medallion house of the 1970’s. You can still see the stove in the wall that is very much like the Brady Bunch. The house was in rough shape and gutted in 2005 and rebuilt on the inside with Diva Dan’s vision of what a home is to be. The house layout today is open concept verses being compartmentalized into rooms like it was originally designed to be. Our home is unique in layout and style verses all of the homes here in Walkerton, Ontario. This renovation is about $325 CDN. The majority of the costs were in the Benjamin Moore Paints. Due to the vibrant Bright Lime used. A primer of a very close colour had to be purchased an applied first. The final colour is partially transparent for the Bright Green. This means the colour of the primer is seen through. The final colour applied is the colour that makes it illuminate. Major repairs of the wall for the patio door had to be constructed. Patio door was installed in Oct 2013 but the walls around it were not finished. The Crochet Crowd Dining Room Before Make Over. a little dissatisfied, inclined to perform a little customization! A wonderful transformation! Daniel is not just another pretty face. He is very, very talented. Along with being a professional violinist he could be a professional interior decorator although I’m sure his time is used up elsewhere. Awesomesauce! I love, love, love BM aura paint. I’ve repainted my entire house with transforming colors in the same way you and Diva Dan have done. My Library is transandential ( deep blue green) and moraccan spice (burnt orange). My kitchen/dining room/living room one big open space 65′ long is morning light (a very pale green) and new penny (a coppery orange). Master bath is deep ocean (bright navy blue) and aqua with white cabinets. My guest room/office is chocolate and turquoius, My powder room is deep red. The floors throughout the house are hand scraped cherry wood w/a mohagony stain (I would call the color chestnut) My next room to paint will be my master bedroom. 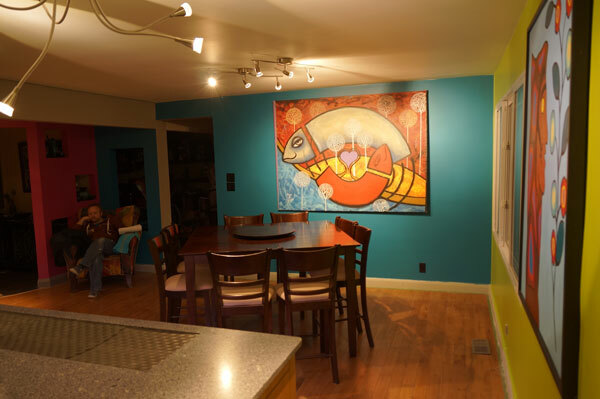 It is a big room 20′ x 22′ and over the past 12 years I’ve painted it no less than 5 times. This time I think its going to be Coney Island (deep gray green) and Ambergine (dark purple) with pale teal accents. My home is a 1940’s rancher that I’ve spent 12 years transforming. My partner just shakes her head and says whatever dear “it’s only paint” if we hate we can just paint over it. Keep up the awesome work, can’t wait to see what’s next. Absolutely stupendous. I wish I could put colors together that well. I love that open look, and the paintings are wonderful. You guys are great together. I really like the way the light plays off the ceiling along with the pop of pink from the other room. This is a beautifully done space! You both deserve to live in this beautiful space, so enjoy it every moment your in it!!!! 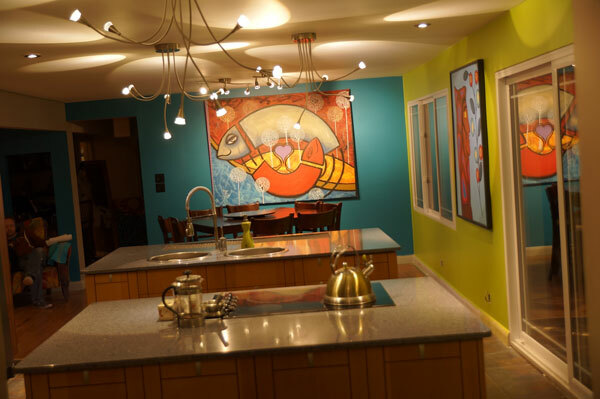 Love, love, love the colors…..they completely change the room. All I can say is: WOW! WOW! WOW! I LOVE IT!! 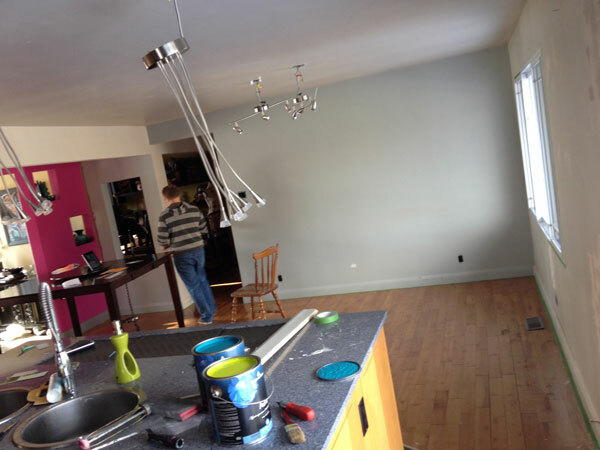 I’ve been putting off painting for awhile…your remodel inspires me get going on my house!! Love it, it is amaizing the work you do. Congratulations Dan and Mikey, your house looks spectacular. Love both paintings, they are beautiful. House looks exquisite. Very talented you two. I wish i can have your talent to make over my house. It’s looks wonderful,great job Diva Dan. Colors make the the pictures pop. Love it. Love the colour and the updated features it all goes very well together. Beautiful colors and I love the artwork! Love what you are doing to your house. Awesome bold colors!!!! Love the wonderful colors!! Can you tell me where you got your lights? They are awesome and would be perfect in my home! Do you guys rent yourselves out? I can not imagine getting so much done is such a short time. It looks fabulous! The space cut out is actually an aquarium with fish. It’s under the island to provide ambiance. Diva Dan designed the kitchen. Absolutely love the colors…matches the creativity that you both have! I love it!! The colors are beautiful. Glad you have to look at it every day and not me; not my personal taste. You did however, do an excellent job of color matching and modernizing it. I would love to bring this much color into my house ! My hubby on the other hand always tells me you like the brightest colored yarn . So I know I would never get away with it ! but it looks awesome in your house. I’m so envious. Diva Dan–I wish I had your talent –amazing!!! Love how you opened it up and then used color t make it all flow and come alive. Love the colors but dont like it when benny moore upsells, yes they have good paints but your walls were already primed so did not need the primer in Aura line . Have been in painting business for many years. Have yet to see a true self priming paint. I have to say… I HATE THE PRICE… but I love how it goes on… It has saved us a lot of time. I have used other brands where the first coat is really lousy… with this paint line the first coat is nearly good enough to stop at. Not quite but almost.